This report is designed to help IT organizations more effectively plan for the adoption of solutions that can help bring together a unified view of IT service performance as it impacts business outcomes. 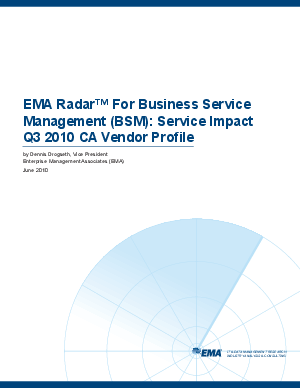 The very term, "Business Service Management" (BSM) is far from linear in meaning, and it's safe to say that each of the fourteen vendors here represents a unique design point, each of which is relevant in its own way to supporting BSM requirements. The report will nonetheless show how different vendors cluster across different types of functionality such as "platform," "overlay," "monitoring suite," and other categories relevant to the many constituencies that require insights into IT services from both a performance and business impact perspective.